The secretary general of the Lebanese resistance movement, Hezbollah, has implicitly referred to some new military strategies it has adopted against the Israeli regime. The Hezbollah leader Hassan Nasrallah in a speech on February 16 talked about speculations on Tel Aviv’s decision to attack Lebanon. According to a report by IFP, he said the current political developments revolve around US President Donald Trump, who might allow Israel to wage a war on Lebanon. He noted it is not yet clear what the new US administration’s priorities are regarding the Middle East. Nevertheless, he said, even if this speculation is true, it will not scare Beirut. He touched upon unity within the Lebanese army, government and Hezbollah, adding the key concern for Israel is the Resistance Movement’s might and its strong power base as well as the fact that Hezbollah and the army work in tandem, not to mention the strong position adopted by Lebanese President Michel Aoun. Zionists [Israelis] flew into a rage and got worried when Lebanon’s president in a speech at the headquarters of the Arab League in Cairo talked about Quds, Islamic sanctities, the responsibility of Arab states towards Palestine, and Hezbollah, and stressed that the Zionist enemy has managed to turn the Arab-Zionist conflict into an Arab-Arab one. Nasrallah expressed regret that some Arab countries backed by the Israeli regime are even ready to pay for the cost of an Israeli war on Lebanon. He touched upon Hezbollah’s muscle-flexing and said the Movement’s stable and strong power base, which has passed the test of Syria over the past years, and was the deterrent force against Israeli aggression against Lebanon between 2007 and 2016, will remain so in the future. Nasrallah further referred to the Zionists’ fear of the threats made by Hezbollah. “Some time ago, Israel decided to empty the ammonia reservoirs in the port city of Haifa in ten days while the reservoirs had stood there for dozens of years. Why?” he asked. The reason is that the resistance movement had compared the reservoirs to atomic bombs. “Another reason is that I said in one of my speeches that the ammonia reservoirs in Haifa are like potential A-bombs, but Israelis have talked of a ship carrying ammonia, which sails across the sea to supply the material to Israeli reservoirs. 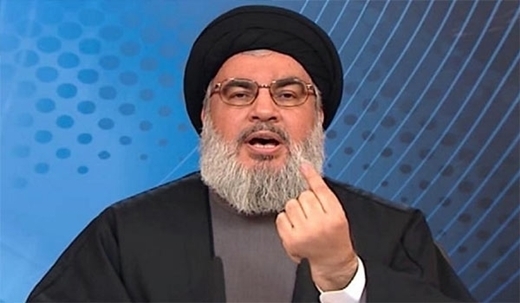 This is similar to five atomic bombs,” said Nasrallah. He said this vessel may be able to escape our missiles or Israel might hide it or empty the ammonia reservoirs in Haifa. However, he added, those reservoirs will be within the range of our missiles no matter which part of occupied Palestine they will be transferred to. Nasrallh pointed to the Israeli regime’s defeat in previous confrontations with Hezbollah, and said Tel Aviv knows well that aerial war alone will not necessarily secure victory in a combat. Nasrallah then implicitly referred to Hezbollah’s operational power within the occupied territories. He said Israeli officials and military commanders have realised that from now on, Hezbollah will not just defend the Lebanese cities and fight inside Lebanon.